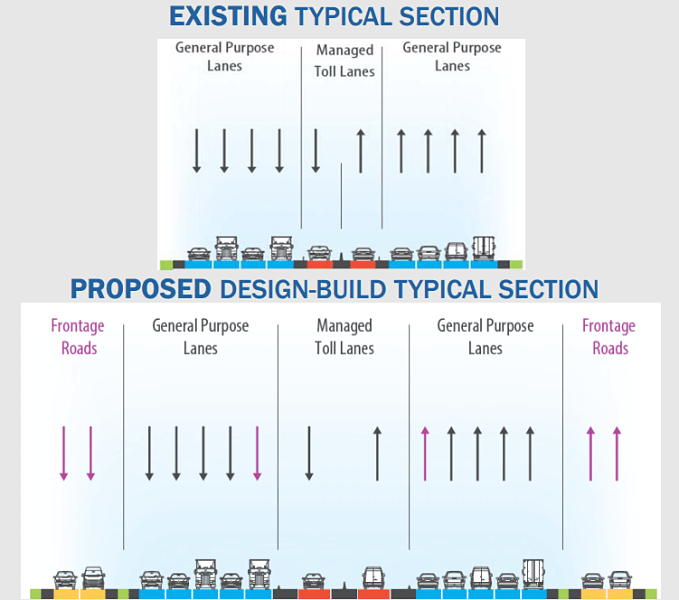 In their fourth Highway Boondoggles report, U.S. PIRG and the Frontier Group profile wasteful highway projects that state DOTs are building across the country. Today we highlight the LBJ East Expansion project in Dallas, Texas. The costly expansion of an already enormous highway will create a roadway with 14 lanes plus two frontage roads. Texas officials have proposed a $1.6 billion road expansion of the LBJ East, a highway that partially circles northeast Dallas about 10 miles from the city center. The project would add two lanes to the 10-lane highway, as well as two lanes of frontage road on either side of much of the highway, creating 16 lanes of roadway in total. The new lanes will result in more driving and more pollution. According to one project document, building the lanes will result in more emissions of toxic air pollutants like benzene, formaldehyde, and diesel particulate matter compared to the “no build” scenario. Meanwhile, Texas and the Dallas area have other urgent transportation needs, including the improvement of local rail and transit service. Because of limited funds, Dallas Area Rapid Transit, or DART, is being forced to decide between a number of transit improvements, including new rail lines and improved bus service. DART is also looking into building a subway, for which cost estimates range from $950 million to $1.3 billion. Building the LBJ East expansion would also add to Texas’ already massive debt. As of February 2018, the project is in limbo following the Texas Transportation Commission’s decision to not include toll roads in the state’s plans, following extensive political backlash to the proliferation of toll roads in the state. However, officials are still working to move the project forward. F Texas. If that monstrosity is what they want let ’em go ahead. I’m tired of caring about what Trumptards want. Why is this showing up in Streetsblog SF? Streetsblog is one of the many slushes funded by Bloomberg. They’re beating the drum. I lived there for a decade. Texans love their pickups and their freeways and their lifestyle. Why don’t you go down there for a weekend, pull up at a restaurant or bar somewhere and start a conversation telling them about it? Let us know if you make it home without a trip to the emergency room. Obvious to me they don’t know what they are talking about – Mass transit WILL NOT solve the congestion problem on LBJ – That’s just dumb!